Navigate to the assigment in the Submission Inbox. 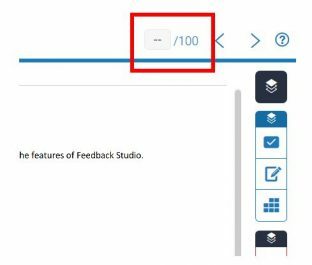 Click on the assignment title and it will open in the document viewer in Feedback Studio. In the document viewer you will see two dashes/the maximum mark achievable. Click into the dashes and type in your mark. Click away from the mark anywhere in Feedback Studio for the mark to be saved. Repeat this process to edit the mark.